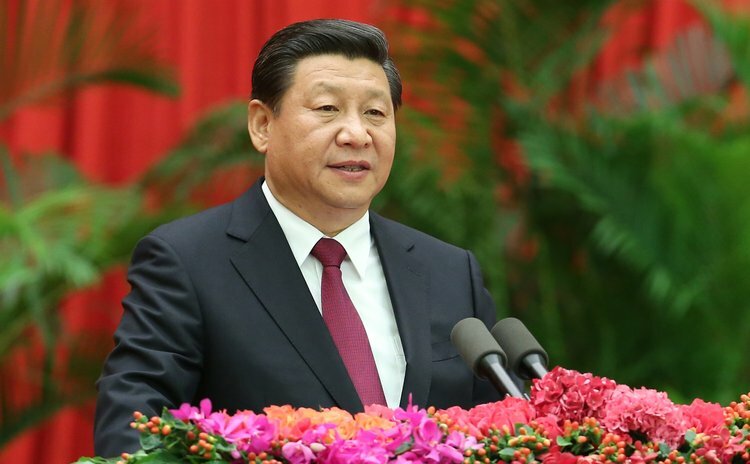 Chinese President Xi Jinping delivers speech for the Communist Party of China Central Committee on 65th anniversary of the founding of the People's Republic of China, Sept. 30, 2014. BEIJING, Sept. 30 (Xinhua/Sun) -- President Xi Jinping said Tuesday China will continue to give priority to development, adhere to reform and innovation and stay committed to the path of peaceful development. Xi made the remarks when addressing a reception marking the 65th anniversary of the founding of the People's Republic of China (PRC). "We must stand firmly with the people," Xi said. "We will always proceed from and aim at realizing, safeguarding and developing the fundamental interests of the overwhelming majority of the people." The Communist Party of China is key to the country's success, Xi said. "We must never waver in our faith and must never separate ourselves from the people," he said. "All problems that affect the Party's creativity, cohesiveness and effectiveness must be addressed, all illnesses that harm the Party's advanced nature and purity completely cured and all tumors grown on the healthy organism of the Party removed." "A nation may thrive in adversity but perish in ease," he said. "We cannot afford to be complacent at any time. This is certainly true for both the Party and the country, including the leadership and the people." "Sixty-five years is but a fleeting moment in the history of human development. Yet in this short space of 65 years, the Chinese people have made spectacular and Earth-shaking changes," said Xi. "Our road ahead is long and arduous, and we must be fully prepared for the great struggle that has many new historical features," he said, adding that the Chinese people are sure to prevail over all hardships and difficulties and take China into an even more glorious future. On behalf of the CPC Central Committee and the State Council, Xi paid tribute to Chinese people of all ethnic groups, all the CPC members, all officers and soldiers of the People's Liberation Army and the armed police, and all members of the democratic parties and personages without party affiliation.